2013 brings smart transmission assets, mobile-linked outage management, and a promise to dive deep into distribution grids. Back in 2010, ABB took a big step toward taking on the challenge of integrating back-office information technology (IT) and grid-side operations technology (OT) into a common architecture for the smart grid. That’s when the Swiss grid giant spent $1 billion to buy Ventyx, an Atlanta-based company with a suite of software, collected via acquisitions and internal development, for power plant and transmission grid project planning, grid load forecasting, network optimization and business analytics. Since then, the combined companies have rolled out several new products addressing both the IT and the OT sides of the smart grid equation. At the same time, as with all such massive technology and organizational integrations, things haven’t always gone smoothly. At this week’s Ventyx World 2013 customer conference in San Francisco, smart grid industry watchers had a chance to catch up on the latest developments in this massive project -- as well as to learn how Ventyx and ABB are planning to move past the integration stage, and toward a unified software and data analytics approach. Ventyx CEO Jeff Ray, who joined the company in June 2012, said during a Wednesday press and analyst lunch briefing that over the past year he’s had to face some serious customer concerns about the company’s path to upgradeability for its legacy software products, as well as the progress of the ABB OT and Ventyx IT merger. In response, Ventyx has reorganized its business from top to bottom, shedding many of the 48 product families it was supporting when he joined to concentrate on core industries including oil and gas, mining, and, of course, energy and utilities, he said. The company is also ending its legacy practice of custom-designing software for its multitude of clients, in favor of a unified architecture to support IT/OT integration, he said. At the same time, it’s branching into managed services and working with a variety of system integration partners to support big data collection and analysis and mobile and cloud-hosted services, Ray added. This is a common refrain in the smart grid world, where every big vendor is promising similar new integrated functionality and data analytics, whether through in-house development, mergers and acquisitions, or both. Power equipment and grid giants such as Siemens, General Electric, Schneider Electric, Alstom and Toshiba/Landis+Gyr are in the game, as are grid integration contenders across the globe, such as IBM, Cisco, Oracle, SAP, SAS, Accenture, Capgemini and Infosys, to name a few. How do ABB’s OT and Ventyx’s IT combinations stack up against the competition? This week, the companies highlighted three projects that help explain just how they’re approaching the grand smart grid integration game. 1) The Asset Health Center: Taking aim at condition-based O&M and capital costs. Ventyx already makes software to help utilities and energy companies predict, plan and execute giant power generation and transmission projects. On Wednesday, it and ABB announced the next logical step in that process -- moving into actively diagnosing and maintaining those assets in the field. That’s the idea behind the Asset Health Center, a project with U.S. utility AEP started in 2009 meant to turn the maintenance of multi-billion-dollar transmission lines, towers, substations and other gear from a passive and reactive process to an active, data-driven task. In November, AEP announced it was taking the Asset Health Center live to manage the transmission substations that connect its 34,000 miles of transmission lines, and Wednesday's announcement makes the technology available to transmission owners and operators on a commercial scale. In technical terms, the Asset Health Center combines ABB’s condition-monitoring and performance algorithms, part of its Mature Transformer Management Program condition-assessment program, and the Ventyx FocalPoint business intelligence solution, to predict failures, measure lifespans and track performance of devices like high-voltage breakers, power transformers and substation battery installations. GTM Research’s recent transformer monitoring report gave the ABB/Ventyx solution high marks against competitors like GE and Siemens, noting the breadth of the Ventyx IT portfolio and focus on providing a complete solution. With only one of four phases complete, AEP hasn’t disclosed financial figures on the operational and maintenance benefits it’s seen so far, but it has cited big reductions in the time, cost and engineer-hours required for the tasks that the Asset Health Center has now automated. That's not to mention the value of all this data analysis and business intelligence when it comes to determining when devices need to decommission, and providing qualitative support for the purchase of new assets to justify and improve the success of rate case proposals, GTM Research smart grid analyst Ben Kellison noted. Beyond transmission systems, Asset Health Center is being developed to support other industries, including nuclear power plants, where Ventyx is already a huge player with customers such as EDF in France, and mining, where ABB/Ventyx have a stake via the 2011 acquisition of Australian mining software company Mincom. 2) Outage Lifecycle Management: Turning integration into workflow. A power outage, whether it’s a single downed power pole or a Hurricane Sandy-scale disaster, is far more than a single event. Each outage has to be planned for, and each restoration includes directing utility work crews and equipment, ensuring a safe and reliable fix, and then logging and verifying the results. Most utilities don’t do all of these things from a single platform today, however. Ventyx says its new Outage Lifecycle Management Solution does, and on Wednesday announced details on how it’s working with utilities like Detroit-based DTE Energy to prove it out in the real world. Beyond integrating fault detection, outage management and asset maintenance, the new product is meant to integrate the workflows between systems, to do things like flow data entries from field repair crews into utility logistics systems, regulatory reporting documents and the like, according to Rick Nicholson, Ventyx’s vice president of transmission and distribution solutions. Ventyx is also building mobile capabilities into this offering, a first for the company. Michael Hamilton, director of product management, did an on-stage demonstration of how Ventyx has incorporated geo-location, field equipment schematics, live video and in-the-field data entry into a single application, available on Android and iOS devices.We’ve seen contenders across the spectrum promise this kind of utility-specific mobile functionality, from long-time industry specialists like Clevest to would-be smart grid master networkers like Cisco. While Ventyx didn’t provide details on just how it intends to roll out its own mobile capabilities, it will be interesting to watch where they start showing up as part of the company's outage management offering. 3) Distribution System Operations Solution: Reaching the edges of the smart grid. 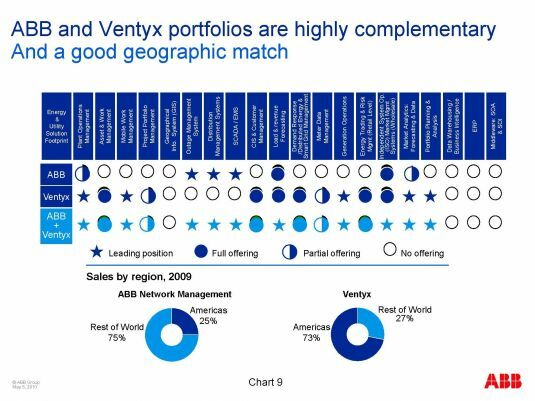 Most of Ventyx’s background prior to its acquisition by ABB dealt with large-scale grid systems and markets. But it’s also been making steps into the distribution grid with ABB since then, with new software for volt/VAR optimization and demand response and distributed resource management, as well as big data analytics tools aimed at distribution grid scales. This week, Ventyx announced that it’s taking on a whole new set of renewable and distributed energy resources, from solar and wind farms to on-site emergency generators and curtailable loads, with its Distribution System Operations Solution, which is still in development. The test bed is Europe, where Ventyx and ABB are working with E.ON to integrate the giant European utility’s grid control center in Malmo, Sweden with a host of OT and IT tools. Starting in early 2014, the partners will begin with a set of big transmission-scale tools like weather and market forecasting and real-time SCADA system data and control capabilities. 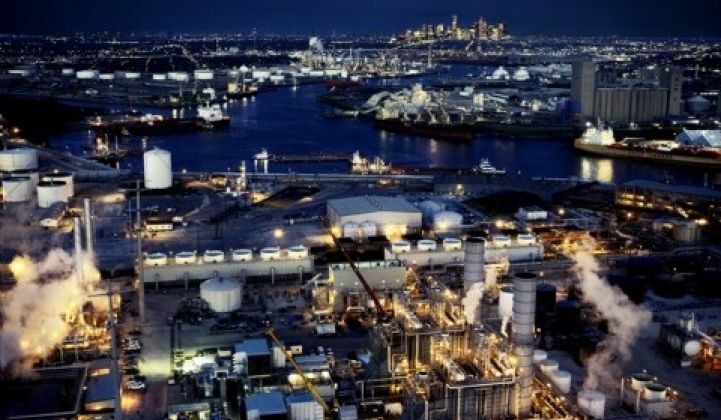 But it’s also scheduled to start tying in industrial motors, boilers and other significant loads into its grid-wide system, much as Siemens and utility RWE have done with their virtual power plant project in Germany. In the future, E.ON wants to tie in demand response systems and distributed generation assets like rooftop solar panels into view for grid operators, Andy Bane, Ventyx’s executive vice president of product management, said Wednesday. Managing those unpredictable, often independently controlled energy assets is definitely a big data challenge, and Ventyx is applying its in-house data management and analytics expertise to the task, as well as working with tools such as Hadoop to incorporate data from smart meters, grid sensors, weather forecasts, market price signals and many other sources, he said. This describes a common set of grid problems that are being tackled by all of ABB’s grid competitors, as well as many of Ventyx’s software and analytics contenders. ABB, which has spent billions of dollars in acquisitions over the past few years, certainly has bought many pieces of the overall puzzle, including wireless networking from Silicon Valley startup Tropos Networks, electric vehicle fast-charging from Dutch startup Epyon, and distributed renewable generation integration from Australian company Powercorp, to name a few.